Dutch Harbor #1 in Landings & Values Again! Dutch Harbor does it again! For the 21st year in a row, more seafood crossed the Dutch Harbor/Unalaska docks in 2009 than any other port in the nation. 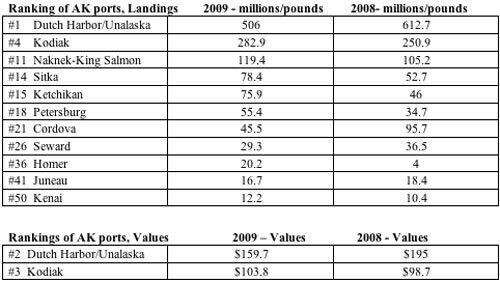 the #2 and #3 ranked ports for landings were Empire-Venice, LA and Reedville, VA. Kodiak ranked #4 for fish landings last year, up from the #5 spot in 2008. In all, 11 Alaska communities made the list of the top 50 ports in the U.S. The information comes from the just released and much anticipated Fisheries of the United States annual report by NOAA Fisheries, which covers both commercial and recreational fishing. According to the report, a total of 506 million pounds of fish and shellfish were landed at Dutch Harbor last year, down from 612.7 million pounds in 2008, a decrease of more than 18%. At Kodiak, deliveries jumped to nearly 283 million pounds, compared to 250.9 million pounds the previous year, an increase of 16.5%. In terms of dockside values, scallops again helped New Bedford, MA retain the top spot at $249.2 million last year. Dutch Harbor came in second at $159.7 million, a drop of about $8 million from 2008. Kodiak landings increased to $103.8 million, up from $98.7 million. Total U.S. seafood landings in 2009 were 7.9 billion pounds, valued at $3.9 billion, down 6% and 11% respectively from 2008. Americans ate less seafood last year - 15.8 pounds per person, compared to 16 pounds in 2008. It's the lowest amount since 2002 when per capita consumption was 15.6 pounds. The National Fisheries Institute will soon unveil the list of the top 10 seafood favorites, based on the annual report. Funding is available for various salmon-related projects and the call is out now for proposals. The money comes from the Alaska Sustainable Salmon Fund with oversight by ADF&G. Projects are selected by the Anchorage-based Alaska Fisheries Development Foundation. The funding focus is on three areas: the first is energy audits for fishing boats - specifically, learning how much energy various salmon vessels use. "We don't have a lot of expertise in that field, so if someone had the ability to contract for energy audits, say on a 32 foot gillnet vessel," that would be of interest," said AFDF director Jim Browning. Another focus is developing new products from salmon wastes (co-products) especially in the Bristol Bay region. Products can be made from fish heads, skins and some guts, and include nutraceuticals, oils, and leathers. Other options include cost analyses of recovery options for export of salmon oil versus use as local bio-fuel; and improvements in packaging and handling materials for salmon, including, recyclable and temperature stable options. Browning told KDLG that the Foundation already has requested a $300,000 federal appropriation for design and site preparation of a mobile plant to process salmon wastes into oils, feeds and other co-products. Creating more awareness of the importance of salmon to all Alaskans is a third focus for funding. "The commercial fishing industry is such an important economic engine to the state, but it goes largely unnoticed, particularly by rail belt legislators," Browning said. "We believe that some coordinated celebration of commercial fishing and the salmon fishery in coastal communities around Alaska would be a good way to raise awareness." Funding ranges from $15,000-$40,000. Projects must begin after October 1 and be completed by March 31, 2011. Individuals or groups may apply. Deadline is September 17, 2010. Contact Jim Browning at jbrowning@afdf.org ( 907-276-7315 or 907-350-8860) or get a proposal form at www.afdf.org. Also check out the six-minute 'Salmon Byproducts to New Products' video. The wholesale prices for canned pink salmon (talls) reported in last week's column were incorrect. The correct prices are $56.45 per case in 2007; $59.77 in 2008 and $75.93 per case in 2009.